Boston College coach Steve Addazio sees a lot of his own program in Purdue. From the close calls to the young lineups to the intricate passing game to the rebuilding process, Addazio has seen it all before. Just last September, his team was the one stumbling along, searching for answers as it attempted to dig out of an early-season hole. Now the 23rd-ranked Eagles hit the road with a perfect record, their first ranking in a decade and a challenging test against the hungry Boilermakers. But Purdue (0-3) has only itself to blame for what’s gone wrong. Personal foul calls against the defense in the final minutes of each the first two games allowed Northwestern and Eastern Michigan to play keep-away, sealing the Boilermakers’ fate. Last week, a replay review overturned a go-ahead touchdown, forcing Purdue to settle for the tying field goal, only to watch Missouri answer with the winning field goal as time expired. The Boilermakers’ goal this week: Avoid their first 0-4 start since 1982. Perhaps they can take a lesson from Boston College’s response to last season’s 2-4 start. Since then, the Eagles (3-0) have gone 8-2 and jumped back into the national conversation. AJ Dillon emerged as one of the nation’s most productive running backs over the last 10 games, and quarterback Anthony Brown is coming off a career-best 304-yard, five-touchdown game at Wake Forest last week. Defensively, the Eagles also are led by a stout safety tandem in Will Harris and Lukas Dennis and defensive lineman Zach Allen. The combination has helped Boston College chase its best start since 2007. Now, the Eagles must show they can beat a hungry team, hoping to emulate their own resurgence. As usual, Brohm has remained quiet about this week’s quarterback plans. Elijah Sindelar started the opener but threw three interceptions in the first half before being replaced by David Blough. Sindelar missed last week’s game with an undisclosed injury, and Blough took advantage by throwing for a school-record 572 yards and finishing with a Big Ten-record 590 yards of total offense. 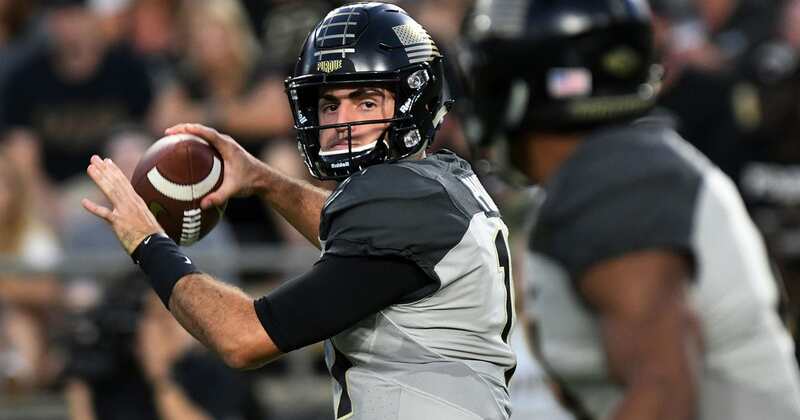 Purdue is hoping Blough’s encore will be equally efficient. Dillon and Brown are helping the Eagles make history. The Eagles have topped the 500-yard mark in six of their last 10 games and have topped the 40-point mark in each of the first three games, a school first. Dillon leads all FBS players with an average of 168.8 yards rushing per game since moving into the starting lineup last October, and his 1,688 yards over the last 10 games are No. 2 nationally to Wisconsin’s Jonathan Taylor. Brown, meanwhile, posted the school’s best single-game passer rating (245.9) since 1996 in the season opener. Purdue freshman Rondale Moore broke Otis Armstrong’s single-game school record for all-purpose yards in his college debut. Since then, he hasn’t slowed down much. Moore leads the Big Ten with 25 receptions, is third in yards receiving per game (87.3), has rushed for 128 yards and has another 179 yards on kick returns. He’s averaging 14.6 yards per touch. Addazio spent three seasons as an offensive line coach at Notre Dame before heading to Purdue’s rival, Indiana, for three more seasons. In six games on those staffs, Addazio went 2-4. He won back-to-back games with Notre Dame in 2000 and 2001 but was 0-3 with the Hoosiers. The Eagles also have two Indiana players on their roster — defensive back Ben Stewart and linebacker Hugh Davis.